On December 7, John Jay freshmen gathered in the Student Dining Hall for the 10th Annual First Year Student Showcase. The showcase is a momentous opportunity for students to present their first research projects conducted as college students. 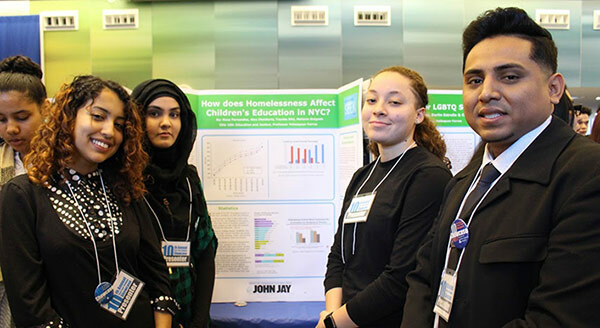 This year, the projects were diverse in topic and medium, reflecting the various expertise and research interests of John Jay’s newest undergraduate class. Similarly, student Michael Torres’s PowerPoint presentation aimed to shed light on Puerto Rico’s current economic predicament. “I’m Puerto Rican so it’s great to be able to express my pride, but the biggest success is being able to inform others,” he said. For many students, conducting research allowed them to delve into topics they’ve always been curious about. Students Michelle Dieguez and Rahat Fatima from the Accelerate, Complete, Engage (ACE) program were interested in how children internalize gender roles from the adults who are closest to them. “Often times we don’t think about the way we act, but we’re not born doing the things we do,” said Fatima. “We picked this topic because we wanted to explore what society expects from us,” added Dieguez. Other research projects represented students’ vested interest in social justice and commitment to New York City communities. 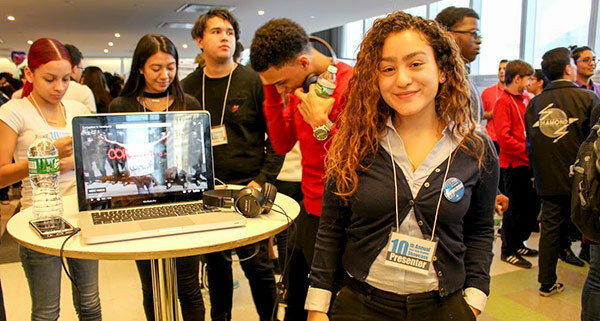 Students Cossette Felix, Christina Montenegro, Trisha Salcedo, and Aman Afzal, who are part of the APPLE Corps program for students interested in public service or law enforcement careers, looked at attitudes towards gentrification and immigration in three Brooklyn neighborhoods. The students did research in the field by approaching neighborhood residents and conducting informal interviews and surveys, a process that exposed them to both the challenges and joys of doing research. New York City Police First Deputy Commissioner and alumnus Benjamin Tucker also attended the student showcase and delivered remarks. “You have to be fierce advocates for justice,” he advised the first-year students. Judging from the research presented at the showcase, it seems like students have already taken that advice to heart. Students Rosa Fernandez, Alex Desiderio, Tayaba Bibi, and Melanie Delgado from the Search for Education, Elevation and Knowledge program (SEEK) looked at how homelessness affects young people’s ability to succeed in school. “People don’t think about it, but if you look at the statistics it’s a huge issue,” said Delgado.